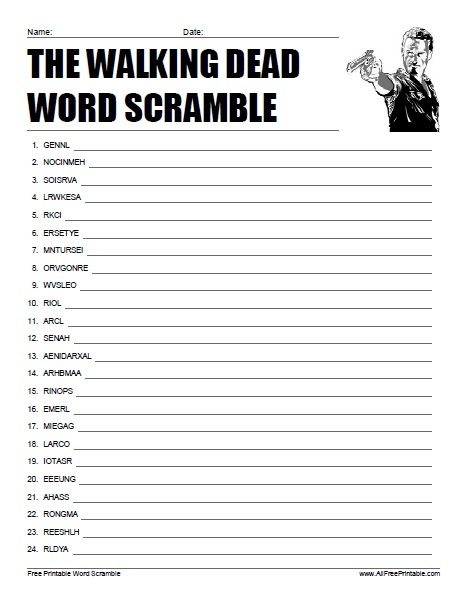 Free Printable The Walking Dead Word Scramble. Free Printable Word Scramble of the favorite TV Show “THE WALKING DEAD”.Print The Walking Dead word scramble game and share it with friends, TWD fans, family, co-workers and have fun unscrambling the words and characters from The Walking Dead seasons. Find words like Terminus, Rick, Michonne, Prison, Daryl, Sasha, Alexandria, Glenn, Abraham, Carol, Tyreese, Hershel, Saviors, Walkers, Sanctuary, Governor, Shane, Carl, Lori, Wolves, Morgan and many more. The word scramble includes the 24 scrambled words from all seasons and answers on page 2. Click the link below to download or print the The Walking Dead Word Scramble now in PDF format.